upper left verso of support in black crayon: (layout) (copyright) Christo 2000 / 16B / ONE WORK IN 2 ITEMS: THESE 2 ITEMS ARE / ONE WORK, THEY MUST NOT BE SEPARATED / AND BE HUNG ACCORDING TO THIS LAY OUT. 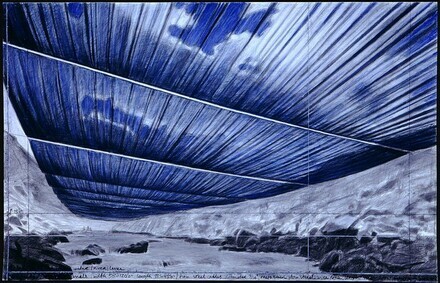 Christo and Jeanne-Claude in the Vogel Collection, National Gallery of Art, Washington; Museum of Contemporary Art, San Diego, La Jolla, 2002-2003, no. 60. 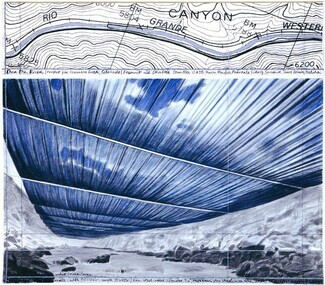 Christo and Jeanne-Claude in the Vogel Collection. Exh. cat. National Gallery of Art, Washington; Museum of Contemporary Art, San Diego, La Jolla, 2002-2003, no. 60.